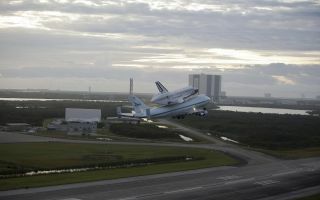 Space shuttle Endeavour takes to the sky from the Shuttle Landing Facility at NASA's Kennedy Space Center in Florida mounted atop NASA's Shuttle Carrier Aircraft, or SCA. In this space wallpaper, Space shuttle Endeavour takes to the sky from the Shuttle Landing Facility at NASA's Kennedy Space Center in Florida at 7:22 a.m. EDT mounted atop NASA's Shuttle Carrier Aircraft, or SCA. In the background is the 525-foot-tall Vehicle Assembly Building where the shuttles were attached to their external fuel tank/solid rocket booster stacks. This image was taken Sept. 19, 2012.